Elevate your casual style with this chic Nicole Lee "Sentimental Sophia" Satchel Bag. 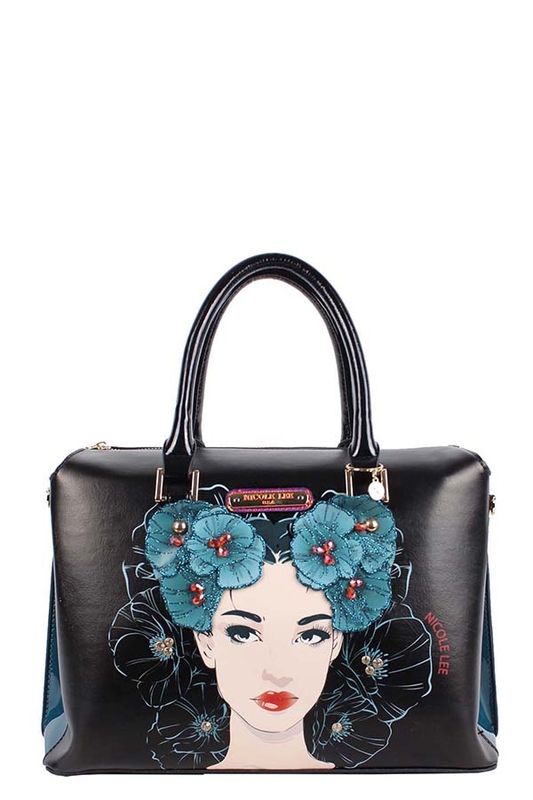 Exterior Features: Made of vegan leather with NL exclusive print "Sentimental Sophia". Floral appliques with bedazzled embellishments. Metal zipper closure with NL monogrammed zipper pull. Dual Top handles. NL authentic medallion. Detachable shoulder strap. Zip wall pocket at back. Structured silhouette. Protective metal foot base. NL nameplate at front. Interior Features: Multiple compartments, zip wall pocket with NL nameplate at back, vegan leather key chain strap, double open wall pockets at front and NL logo premium lining. Vegan leather handles with 5" inch drop.